Having in mind that the children have deficit in concentration and are easily irritated, they easily got tired by the noise and the work we provide calm and familiar to the children environment and individual work for the basic subjects. We have developed individual educational plans according the physiological abilities and possibilities of each child. These children love using technology and IT helps them work longer and understanding better the things. So planning and preparing for the lessons we use Öpen-Sancore” Programme for preparing activities for the interactive white board. In the attached downloadable materials we provide such activities. For example - Children come to the white board and using a pen or a finger they move the objects. Multiplication with 5. Children touch and move the Math problem to match with its answer. When there is a mistake the answer is coloured in red but when the answer is correct, the colour is green. The way they work is interesting for them and using the colour red for a mistake and green for the correct answer is easier to accept the mistake and to celebrate the achievement. This is a pleasure for them and also working with a tablet or a computer. They expect anxiously the classes and activities with IT. 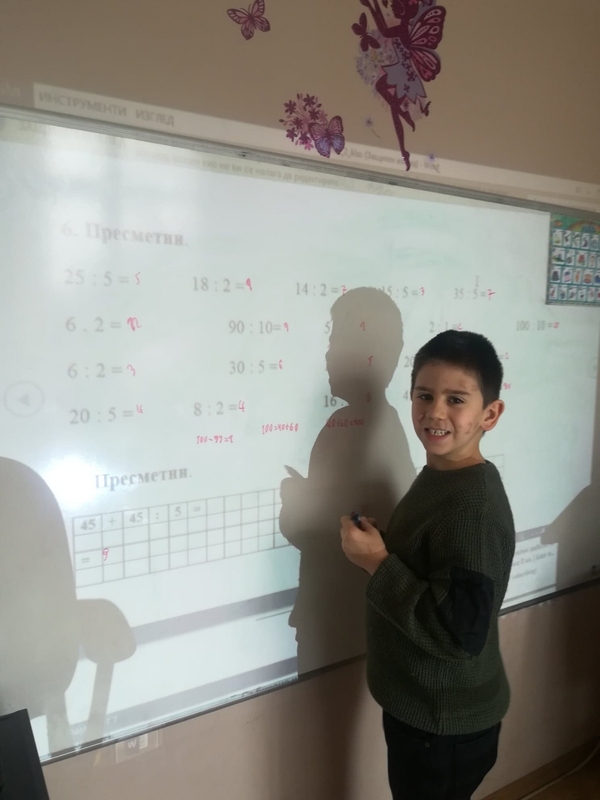 Even the child who does not like Maths is doing the maths problems if they are presented in an interactive way by moving the objects and matching the answer. We use another way of solving the Maths problems by using a ruler. This very simple object helps the teacher and the child. How to do sums with a ruler! For example: 5+3=8. First the child finds number 5 and puts the finger there. Then the child counts up from 1 to 3 and puts the finger at 8. This works with the opposite action 8-3. The child counts up from 1 to 8, puts the finger on 8, counts down 3, puts the finger at number 5. Difficulties in achieving the educational results because of the necessity of more continuous work for building and following the rules and the norms.